No doubt partly driven by necessity as much as strategy, Nintendo's Virtual Console efforts on Wii U have been notable for including not only Game Boy Advance titles, but also various releases from the DS library. 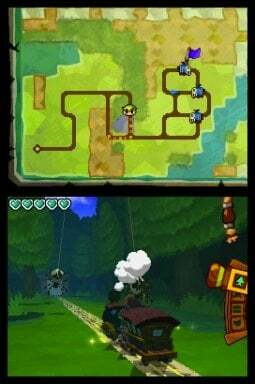 With the latter only possible courtesy of the Wii U GamePad questions of practicality are fairly raised; The Legend of Zelda: Spirit Tracks is put to the test, then, as it was the second franchise entry to rely solely on touch controls. What we have is a functional version of game, though a high quality title like this arguably deserves its native surroundings. It's easy to forget what a game-changer the DS initially was in terms of introducing prominent touch controls, and Spirit Tracks adopted the same mechanics as The Legend of Zelda: Phantom Hourglass with core movement mapped to stylus pressure, taps and swipes. Though this method is a smidge less precise than physical controls, it's nevertheless intuitive and easy-to-use for any gamer comfortable with touch screen gestures. With the precision afforded by a stylus on a resistive screen there's a solid combination of inputs; with a little practice most will be able to explore, fight and solve puzzles with few mishaps. This was also the second portable entry to use a 3D world, with on-foot exploration being locked on an overhead view while sequences riding this title's train show off the wider environment and dynamic camera. This portrayal of the Toon Link aesthetic may look rather rough by modern standards, especially if blown up on a TV or even just the GamePad screen, but they have a charm to their design that helps ease the cross-generational shortcomings. You can also enable the image smoothing feature of the Virtual Console to take a little bit of the edge off. The design and storytelling can easily win you over, in any case. From the headstrong Princess Zelda to the delicious exaggeration of a heroic train driver saving the day, this delivers a typically heart warming experience. Overall the setting and context are rather odd, even by the franchise's standards; all to accommodate the fact that the development team clearly thought it'd be fun for our hero to drive a train. It may just be a case of drawling a line on a map and making mild adjustments - or firing a cannon - as you ride the rails, but it's undoubtedly designed primarily to raise a smile. Messing around and spending hours upgrading the train becomes an oddly transfixing part of the experience, as does running errands and transporting passengers around the world. There are other smart ideas at play among a raft of familiar and recycled features, too. Naturally you travel the world unlocking areas, while also accessing new levels of the Tower of Spirits once each region of the world has been conquered fully. In general the dungeons do a good job of introducing new items and posing a respectable challenge, providing a nice game loop of travel, puzzle solving and boss fights. 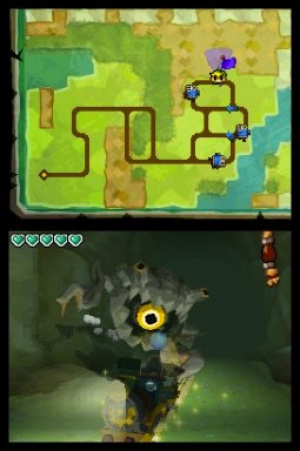 Occasionally you also tackle puzzles in which you manage and control both Link and a phantom, with some of the later areas within the Tower of Spirits being particularly tricky and fun to figure out. It's the same excellent game we reviewed upon its original DS release, then, but we do feel this is a good example of a title that falls down a notch on unfamiliar hardware. Just like with Phantom Hourglass you need to find a setup that works, and any that involve both the TV and Wii U touchscreen are rather flawed; areas that require constant referencing of the map aren't very well suited to having the bottom screen on the GamePad and that top screen map on the TV, while the viewpoint that shows a virtualised DS handheld within a horizontal screen on the controller is a tad silly in practice. Yet having both screens (left or right-handed) on a vertical GamePad is also flawed. Though the actual screen real estate matches up quite well with the DS hardware it's an ergonomic nightmare, with the vertical Wii U controller feeling heavy and ill-suited to that approach. The biggest issue, though, is with the microphone. This is a game that requires regular blowing into the microphone, either for some special items or to play a set of pipes that are required in the storyline. Blowing into the microphone with the vertical setup, while manipulating the notes on the touchscreen, is remarkably flawed. Though fine in its horizontal setup - which isn't ideal for the reasons highlighted above - the GamePad's microphone seems to struggle to pick up blowing inputs when the controller's being held vertically. So you can struggle in vain using the vertical aspect that works best with 90% of play, or switch screen types when you need to learn a new song and make progress. As for boss fights that require near constant use of the microphone, be prepared to turn the air a little blue. That's the key point we want to make in this review - this is the same charming, high quality DS Zelda experience that we assessed in 2009, but it's now bolted onto hardware that doesn't suit its unique controls quite so well. 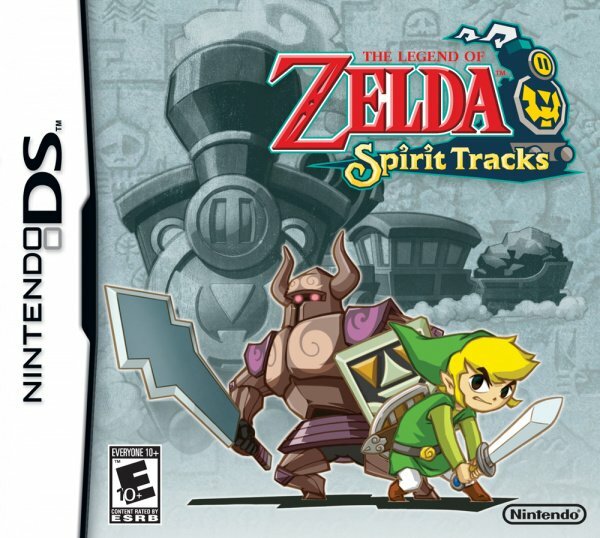 The Legend of Zelda: Spirit Tracks is an excellent entry in the series - it tweaks, expands and in some ways improves on the foundations of Phantom Hourglass. Yet its touch based controls with liberal use of the microphone don't work as well as they should on the GamePad, with the Wii U struggling to find the ideal display format for the title. If you're playing this on the DS or even using the backwards compatibility of the 3DS, our original review stands and you can add a point to the score below. If you're playing on Wii U, however, be prepared for fiddly compromise in order to enjoy a lovely game. Not to mention that Zelda is the most annoying character in the history of video games in Spirit Tracks. And yes I'm including Natalya and Navi in that. Display mode rotated. Hold gamepad vertically. See both screens at one and at a good size. Profit. I'd like to buy this game and Phantom Hourglass from the eShop but no way am I paying €10 for each of them when I could play both of them for free on my DS. If there was a button (ZR or ZL?) that immediately toggled the television between displaying just the top screen or just the touch screen, then the DS virtual console would be so much more palatable.I'm mostly thinking about Fire Emblem Shadow Dragon when I say this. ... in regards to Spirit Tracks... I dunno, the control scheme is just too weird for this to work on anything other than an actual DS. Its not as great as Phantom Hourglass....simply because majority of the dungeons are too easy and the final boss is a pain to beat because one screwup and you have to try beating him from the start over again. Its nowhere as memorable as Phantom Hourglass which I love by the way. Still its a good enough game worth getting for Zelda fans. Blowing into the microphone is a gimmick that shouldn't have been used again after WarioWare on the DS overused it. While it was a cool idea at the time, I think it has aged really badly and is very tedious now. Is there any continuity in the story between this, Wind Waker, and Phantom Hourglass? The dungeons were great, better than Phantom Hourglass', but the overworld was not and the fluye was a pain. Haven't played Spirit Tracks yet. Phantom Hourglass put me off as I wasn't keen on the touch controls. Still feel I will have to play it at some point though purely because it's a Zelda game. @DoctorWily Phantom Hourglass is the direct sequel if Windwaker - continuing right after the events of the game. And Spirit Tracks is Phantom Hourglass's direct sequel - although it does take place about 100 years later. I enjoyed this game. Not my favorite Zelda by any means, but like it's predecessor it was still a fun game. Also you gotta love that train music. I'm glad I bought a used DS copy cheaply on eBay last week. For me it just feels more natural and intuitive to play DS games on a 3DS instead of a Wii U.
I wonder when this will ever be released in NA... my guess is after the release of the NX. I remember Spirit Tracks more fondly than PH, mainly because of the improvements made; plus, I do like trains. The music was more memorable, and I have a love/hate relationship with the Spirit Flute; I liked the tunes you could create with it, but some of the later songs are a real workout. I don't understand why Nintendo is insisting on shoehorning games into this half-baked emulator instead of simply putting DS games on the 3DS eShop like they have with Wii games on Wii U.
Nintendo needs to do downloadable DS games on the eshop. Honestly, I love this game very much, it's one of my favorite Zelda games as a matter of fact, right next to Majora's Mask, Wind Waker and ALttP. 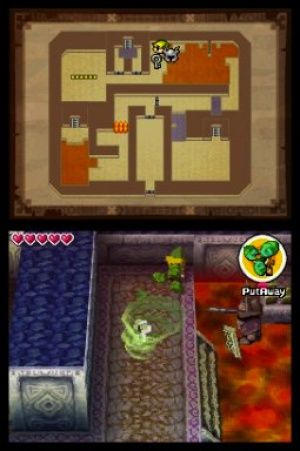 The travelling by train is just so relaxing and Phantom Zelda is used quite creatively in puzzles. I just love that Zelda is joining Link on his quest for once, and it's my favorite of all Zeldas, too, Toon Zelda. Sure, the blowing into the microphone is a bit annoying and there could have been more dungeons but it's a major improvement on my least favorite Zelda game, Phantom Hourglass. But I'll just keep playing it on my 3DS. It's interesting to see people's preferences regarding this and PH. I actually didn't enjoy this game very much, but was head-over-heels in love with Phantom Hourglass. It wasn't exactly epic, but I found it to be a perfect, bite-sized Zelda in the image of Wind Waker. I thought it managed to convey a fantastic feeling of exploration for such a small world, and I really liked the contrast between the claustrophobic dungeons/tower, and the freedom of sailing between islands out on the open ocean. With Spirit Tracks, I found the train mechanic really restrictive (even if the music was nice), and obviously, the dungeons were somewhat restrictive by nature, so I just didn't get on board (ba-dum-tisch) with the game in general. I don't remember liking the plot or characters quite as much either. Or maybe that's all rubbish and it just comes down to which colour you prefer staring at for extended periods of time; green or blue? I would rate both Phantom Hourglass and Spirit Tracks 8/10. I think they both are really good games, but a few things are annoying and could be better. I don't like how they guide you all the time (kind of Skyward Sword) and Spirit Tracks doesn't explain the train parts importance at the beginning so you might end up selling them all before knowing you can use them to customise your train, that happened to me. Also, these games should be on 3DS. I have the game on DS, but honestly could never at all get into it. This is fair. It is my least favorite Zelda game. I still own it and playing through it once was enough for me. I thought the controls were annoying on the DS. So it would not surprise me if it were bad on the WiiU. That whole blowing thing did make the game less enjoyable and the stylus scheme looked like they were trying to hard to get us to use it. I like Phantom and would go back to that one but this one meh. If you haven't got it get it. It is not bad just not a Zelda game you would expect. I have the original. Never finished because never got in Dune Sanctuary. Nope, I've tried for HOURS and no. Too bad, I liked it. One annoying way to make progess in a game. Sheesh. I never got round to playing this one, which is strange because I loved Phantom Hourglass. I'd rather play the DS version on 3DS though, so won't be touching this. This is a great game, but the spirit flute RUINS it!!! I still can't beat it due to that horrible instrument. 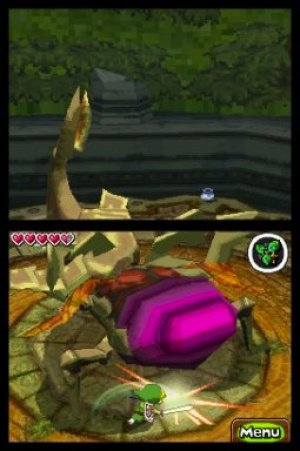 Why did the DS games have to have item based gimmicks like the hourglass and flute? Its a shame they don't put DS games on the 3DS shop like they put Wii games on the WiiU shop... (also GBA games...but that's not as big a deal). @wazlon Spirit Tracks is much better. I love PH, it was the first Zelda game I beat, but ST feels much more like a Zelda game. I think my least Favorite Zelda game is Zelda 2. PH and ST are my babies. This game was the better of the DS iterations, but still not quite as good as other Zelda games. @Sligeach:: I think it it was a temporary discount, but you could actually get both games for 15€ (after you bought one of them, the other costs only 4,99€) when they were released in the eshop. That's what I did and I totally regret it. I was curious since I never had played those two Zelda entries, but it didn't last more than a few minutes. The thing with the display isn't that bad, I have the horizontal view with the map as the smaller screen. But the graphics look really terrible, I don't like the touch controls and the thought of Link driving a train is still strange to me. I wish I hadn't spent those 15€. The original DS versions would've been even more expensive. Also, I had more fun with Minish Cap and it does look better too, despite being much older than the DS games. And Link Between Worlds was totally worth the 20€, I enjoy it a lot so far on my N3DS and I think I'll also buy Triforce heroes eventually. But I don't think I'll ever play PH and ST again. Good score for a game that does not play to well on the console it was released for. The flute was flawed and annoying from the beginning. The WiiU did nothing new. The improvement over Phantom Hourglass is understated here almost as if everyone forgot the horrible repetitiveness in that game making it the only Zelda game I probably won't ever play through again. spirit Tracks definitely a letter of apology for PH and one I was happy to accept. Thank you, Mr Aonuma. I hate this whole thing. I really want to play this game, and buying it on Wii U is incredibly cheap compared to buying even a used physical copy (about one-third the price!!) But I made the mistake of buying Mario and Luigi: Partners in Time on Wii U and it was a HUGE MISTAKE. That game didn't even use the touch screen, yet focusing on both screens was an absolute nightmare. None of the screen settings worked well (the "virtual DS" setting would work better if so much of the screen wasn't taken up by the DS picture--WHAT THE HECK?) and I was only able to really feel okay playing it when I was slouched back on the couch with the TV just above the gamepad in my vision. A 20-hour RPG that was uncomfortable to play 100% of the time. The fact that this isn't available on the 3DS as well isn't just silly and confusing; it's infuriating. I want to play this game, and yet there's no reasonable way to do so. Awesome. I can always count on Virtual Console for a good laugh. It still baffles me as to why Nintendo dosen't release these games on the 3DS eShop, as the 3ds can play them natively. Maybe there IS some technical reason they don't do it, but I'd be surprised if there is. Woah, woah, woah. NL is rating this an 8/10, while telling people to choose the original hardware version? You all aren't going to rate it a 5 or 6 out of 10, like Kirby Canvas Curse, telling us that the score is largely because the mechanics have aged poorly, are suddenly now unintuitive, and aren't as creatively unique as they were on the original DS release? Let me guess. "Because it's Zelda! We can't be consistent with our previous DS game rating philosophy and give it a lower rating, because otherwise we would be giving a Zelda game a low rating!" I have this game on my 3DS, and the microphone works terribly. I seriously could not get past the Ocean area because I couldn't do the flute duet... Great game otherwise, though! Really backwards thinking to not put this on the 3DS e-shop. I'm really getting ticked off with the way all the great handheld games of past generations are being sent to the WiiU e-shop instead of where they belong. I guess Nintendo want to add value to the WiiU, but nobody is going to buy a WiiU so they can play DS and GBA games on it. However, it is a great game. Well worth buying to play on 3DS. Wow those touch controls are still a turn-off. This game was awful, worse than Phantom Hourglass. They found ways to make the touch controls even worse than before, the train tracks made for a very boring, very linear, very un-Zelda overworld, the pan flute mechanics are flat out broken (you will do better just blowing into the mic and randomly playing notes then actually trying to play correctly! ), and the Spirit Zelda mechanics were worse than having to replay that dungeon over and over again in PH. PH was a pretty bad game too, but ST was worse. Don't know why people say it was better. It was much, much worse. @chiefeagle02 The finicky control scheme is present on all versions of Spirit Tracks. The review was largely complaining about how no display mode for the game seems to work well for the reviewer's preferences. @Arlo The "fact" that a DS game isn't available on the DS? What?! Buy a DS version if you want to play it on the DS. It's IS available and THAT is a fact. @mjc0961 I'd still like to play it. 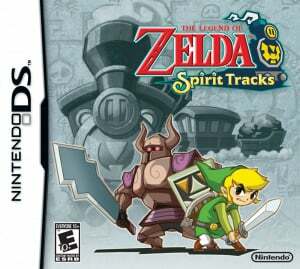 Spirit Tracks is one of the few Zelda games I haven't tried and it's still a little too expensive to get the cartridge. You're right about the display (mea culpa). @mjc0961 I mis-typed. I meant 3DS. I like this game a lot more than Phantom Hourglass. Not as good as other Zelda titles, but both DS games are pretty great. Did not like this game. It felt like the beginning of the whole "go to dungeon, beat dungeon, go to place use item guarded by dungeon boss to find next dungeon" crap. I choo-choo-choose you to be my Valentine's date. And there's a picture of a train! @Kriven Because your dumb handheld can't even handle SNES and GBA games. And before you mention the ambasswhatever games, they're ports. Terrible ones at that. @Melkac what does emulation have to do with porting games to a console that can play them natively? No NA release... yet. Please, NOA, please! 2- For some odd reason, the file system the 3DS uses, or the way it reads your SD isn't the same as it did back in the day for regular DSi software. Any DSi title you download from 3DS eShop goes directly to a portion of your (very limited) internal storage. Some larger games like Pokémon B/W wouldn't even fit. @rushiosan This runs on the assumption that DS-download games have to be DSi games, but that just isn't the case. There's absolutely no reason the device can't launch software in DS-Mode. That's exactly what it does when you use a flash card. If pirates can do it, Nintendo can do it. I love how this review tries to suggest that all the blowing into the microphone stuff wasn't also an absolute abomination on the DS... It bloody was!